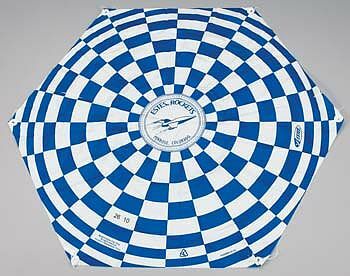 Colorful 18" preassembled parachute with tape rings and shroud lines. Retail $4.99 SAVE 22% ! "Nice to have an extra when needed... and priced right"
My rocket I built was in need of a good parachute, hobbylinc hooked me up with an 18 in chute pre assembled easy to use, another great product from hobbylinc. Iâ€™ve used it on a 6 oz rocket that is about 45 inch tall and the parachute worked beautifully, as the rocket had a slow decent and touched down softly without getting scratched.